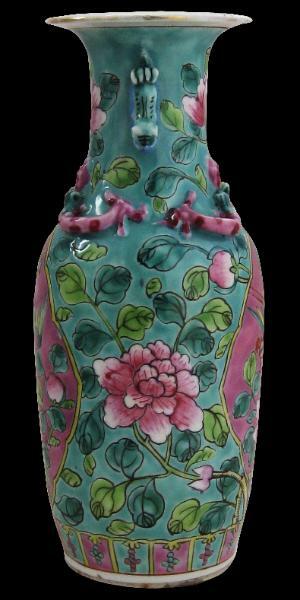 The vase is brightly enamelled with shaped panels containing a single phoenix in flight over sprays of peony blooms, buds and foliage against a pink background, surrounded by a green-ground decorated with further peony blooms and foliage. 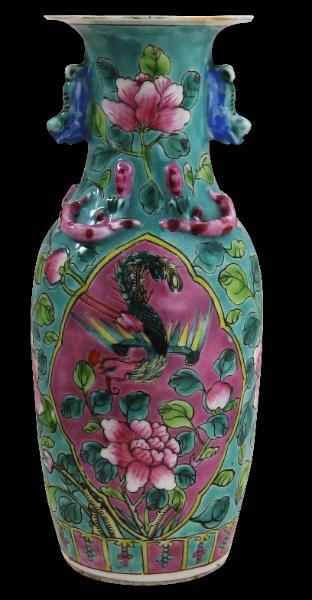 The neck and shoulder have moulded felines with blue bodies and dragons in pink with red spots. The lower part of the base has a border of brightly coloured green, pink and yellow lappets. The rim is edged with gilt. The condition is very good – there are no chips or cracks. The glaze is very bright. There is some kiln grit to the cream glaze to the rim, usually a function of the kilns used being fired by coal. 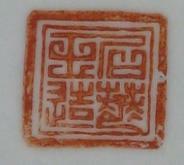 Quchuwang Zao factory mark in red enamel.